Well, April has been fun folks. Rudy, my 5 month old Red Doberman puppy did all of the weekend agility demos at the All About Pets Expo. 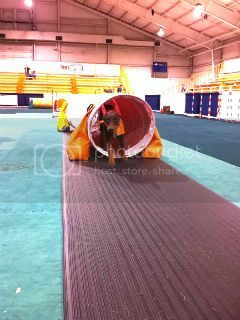 He ran the tunnels, mini jumps and table. All low impact, as he’s still growing. He was little superstar! We are also getting ready to start his conformation career. I thought I’d give ‘Happy Legs’ a try. A tool to help him stand in the correct position. I ordered them online….and the magic of the internet….they came to my door. Here’s a snap of Rudy on his stilts. April is also my birthday month. Traveled with my two friends Evan and Daphne to St. John’s Newfoundland for a 2 day get away! We packed a lot into that short time. Stayed at an amazing B&amp;B, and saw all the sites, ate great food, and caught a Bryan Adams concert too! A great way to mark another year older!